Technology certainly seems to be on the side of plasma. Could price be its downfall? If you bought a large LCD television this year, you may have made a big mistake. At least, that’s what Pioneer technician, Dominic Feeney, says. He thinks LCD technology is so vastly inferior to most plasma screens that it makes no sense to buy a large LCD TV from the likes of Sharp and Sony. "Plasma TVs have a larger and more accurate colour range, a higher contrast ratio and better black level for improved depth of field," Feeney told TechRadar. Is plasma better than LCD? "LCD manufacturers often quote wide viewing angles but don't mention that although the picture is still visible at a wider angle, the quality of picture decreases dramatically off axis. Plasma viewing angles are comparable yet maintain the full picture quality at all times. "Motion response times are also better in plasma TVs. That’s because they typically have less than a millisecond response time; LCDs are just about hitting 4 milliseconds [although Philips' new 9000 series LCD TVs have a response time of around 2 miliseconds - ed]. This is too slow for fast moving action and results in blurred edges especially in fine detail areas. Ironically, LCDs only hold a 1080p resolution with a static image. When the image moves fast, the perceived resolution your eye resolves from a 1080p LCD is actually less than standard definition. Hilarious!" 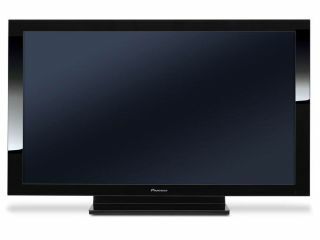 Pioneer is responsible for the creation of the Kuro plasma television range. While quite expensive, the TVs have received rave reviews from both critics and home users alike. But while the Kuro range is undoubtedly the finest on the market at present, LCD panels have also improved spectacularly over the last few years. Viewing angles have been enhanced, contrast ratios are up too. Prices have come down and general quality is up. But Feeney says that the fundamentals of the technology involved mean LCD screens will always be inferior to plasmas. At the heart of LCD’s problems is the fact that the panels are transmissive, which means each pixel is actually a shutter blocking out an ‘always on’ white backlight. Colours are then filtered out from that white light. And because the pixels cannot shut out all the light, blacks come out more like dark greys. "LCD tech was originally developed many years ago as a technology for displaying static images on devices such as the pocket calculator and digital watch," Feeney says. "But in more recent times it’s been adapted by the PC industry again primarily for display of static images. It's only in very recent times that LCD technology has been transferred into televisions and this is down to one simple fact: it's cheaper to make an LCD TV than a plasma one." However this looks set to change with future LCD TVs which use LEDs rather than fluorescent backlights. LEDs will enable LCD TV makers to properly turn off the backlight, leading to a dramatic increase in contrast, as individual pixels will effectively be off when no image is being displayed on the whole or a particular part of the screen. Modern plasma TVs on the other hand work completely differently. They’re emissive displays, so each pixel is made up of a red, green and blue phosphor pocket. When the phosphor is excited by an electrode it emits red, green or blue light. And because there is no backlight, black colours are able to be displayed much more accurately. "Different intensities and mixtures of these elements create the colours and display the imagery," Feeney says. "It was developed about 10 years ago and has been developed from the ground up as a TV device to display moving images with rich colour and contrast. For these reasons, LCD panels will never be able to rival PDPs." It’s not just PDP manufacturers who advocate plasma technology, either. A report published last year by researchers at Synovate sought to reveal consumer attitudes towards both kinds of TV technology. The results revealed a strong preference for the contrast, black tone, resolution, image depth, sharpness, colour and response speed of plasma. And opinions among those who had some prior knowledge of the two technologies swung dramatically toward plasma once they viewed the content side-by-side in an environment similar to their homes. However, one area where LCD certainly does rule over plasma is in the small panel market. It’s impossible to make decent plasma screens smaller than about 37 inches, something the Pioneer man readily admits. "Each pixel of a plasma panel is precision sandblasted into a glass sheet. For a 1080p resolution 50-inch plasma, each individual pixel is about the size of a pin prick in a sheet of paper. To try and replicate this resolution on an even smaller piece of glass, the pixels would have to be minuscule," he says. "It's impossible to do this and still retain structural integrity of the glass, not to mention the reduced amount of phosphor in each cell having a detrimental effect on overall brightness and colour purity." So which television technology should you plump for? It’s certainly not as clean cut as it may seem. While Pioneer’s Kuro plasma range is astonishing, a 50-inch panel costs around £3,500 which is well out of the price range of many people. In contrast, a similarly sized Sony Bravia LCD TV may not be as good, but would cost around £2,000 less. So, as always in cases like these, it comes down to what you can afford.